Own the Xbox One X Robot White Special Edition Starter Bundle (1TB), and dive into the very best of Xbox One. Get instant access to over 100 great games with 3 months of Xbox Game Pass. Enjoy an expansive catalogue of games carefully curated for high quality and fun gameplay, including fan favourites such as Forza Horizon 4, Halo 5: Guardians, LEGO Batman and more. Games are added every month so there’s always something new to play. Play with and against friends around the world with 3 months of Xbox Live Gold, plus receive exclusive membership perks like free games each month and deep store discounts on Xbox One. 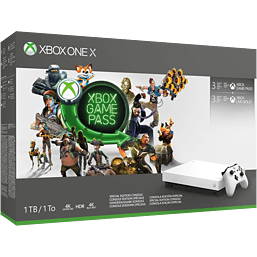 This bundle includes the Xbox One X Robot White special edition console with built-in 4K Ultra HD Blu-ray™, 4K video streaming, High Dynamic Range, premium audio, and an Xbox wireless controller. With hundreds of Xbox One X Enhanced games, immersive true 4K gaming, and 40% more power than any other console, there’s never been a better time to game with Xbox One X. 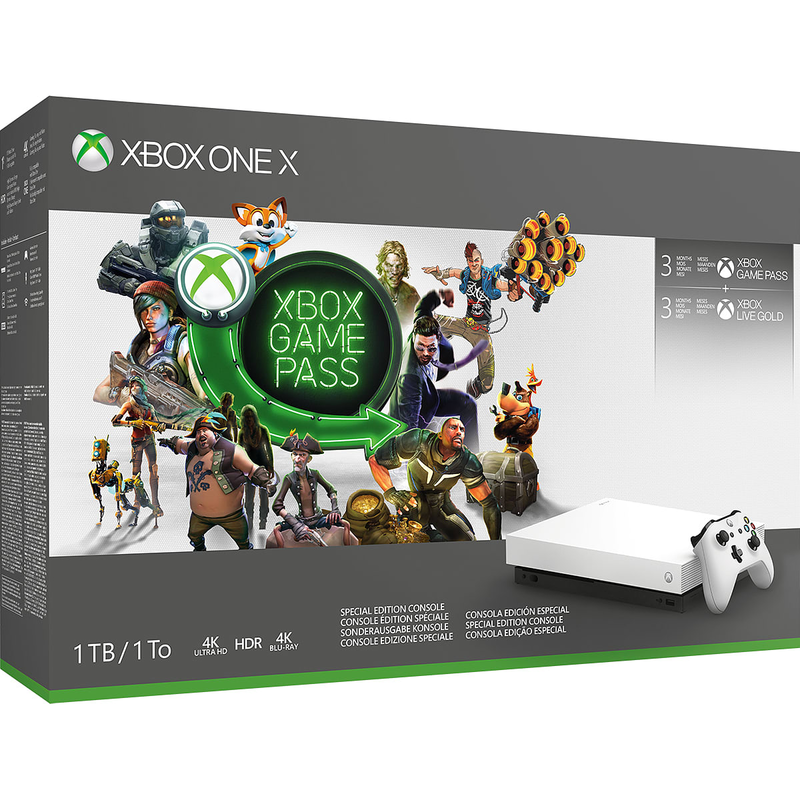 1TB Xbox One X Robot White Special Edition console, matching wireless controller, 3 months of Xbox Game Pass, and 3 months of Xbox Live Gold. Get instant access to over 100 great games with 3 months of Xbox Game Pass. 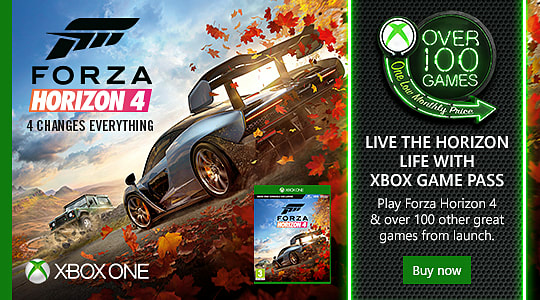 Play new games like Forza Horizon 4 and State of Decay 2, as well as games like Crackdown 3 the day they’re released, and enjoy a wide variety of games, from recent blockbusters, to critically-acclaimed indie titles. With new games added all the time, there’s always something new to play. Play with and against friends around the world with 3 months of Xbox Live Gold, plus receive exclusive membership perks like free games each month and deep discounts in the Microsoft Store. Own the Xbox One X Robot White Special Edition Starter Bundle (1TB), and dive into the very best of Xbox One. Get instant access to over 100 great games with 3 months of Xbox Game Pass. Enjoy an expansive catalogue of games carefully curated for high quality and fun gameplay, including fan favourites such as Forza Horizon 4, Halo 5: Guardians, LEGO Batman and more. Games are added every month so there’s always something new to play. Play with and against friends around the world with 3 months of Xbox Live Gold, plus receive exclusive membership perks like free games each month and deep store discounts on Xbox One. With hundreds of Xbox One X Enhanced games, immersive true 4K gaming, and 40% more power than any other console, there’s never been a better time to game with Xbox One X.
Xbox One has over 1,300 great games including today’s blockbusters, 200 console exclusives, and 400 Xbox classics. Watch 4K Blu-ray movies; stream 4K video on Netflix, Amazon, and YouTube, among others; and listen to music with Spotify and experience richer, more luminous colours in games and video with HDR technology. Access to Online Multiplayer: Xbox Live Gold (sold separately, 3-month trial included) required for online multiplayer on Xbox consoles. Free Games with Gold: Active Gold membership required to play free games you’ve redeemed; restrictions apply. Xbox Game Pass: After term ends, subscription required to play games; game catalogue varies over time (xbox.com/game-pass). Xbox Live Gold: Free Games with Gold – active membership required to play free games you’ve redeemed; restrictions apply. Gold discounts – Savings based on retail value of game. After term ends, subscription required for continued use (xbox.com/live/gold).